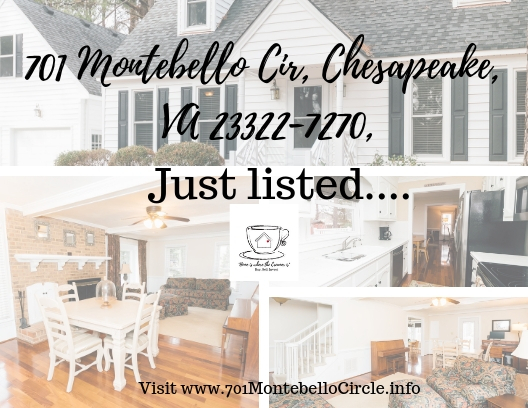 701 Montebello Cir is in the Great Bridge neighborhood in Chesapeake, VA. This property has four bedrooms, three bathrooms and approximately 2,038 sqft of floor space. This property had a lot size of 0.34 acres built in 1983. Enjoy a 1st-floor master and 2 additional bedrooms and a full bath upstairs. Large room over the garage and a full bath make an excellent in-law suite. Enjoy this great location with a large backyard. Lovely hardwood floors throughout the 1st floor have breakfast in a sunlit bay window seating space or enjoy a relaxing day in front of a cozy fireplace. 701 Montebello Cir More photos of this home on Facebook. View the full album.